I wanted to see if anyone is interested in making a deal for a unmanaged vps. I'm back in college working on a degree in network administration and want to know the ins and outs of a vps. What I can do for you is ad your ad to www.host-hunters.com and www.themeologists.com as a sponsor and will stay there for the life of the vps. The theme site is still under construction so that is going to be a couple more week before it's up 100%. I will also do a honest review and tweet it out. These 2 spots were the ads are I charge $10 for a month, so I offering you 2 of them. I'm interested in a vps about 1gb ram, 20 Gb diskspace and 500 to 1000 GB in traffic. I will use the vps for these 2 sites as well. 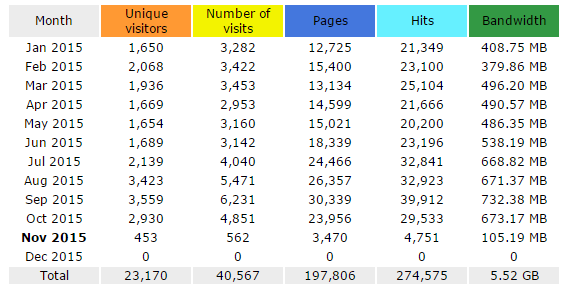 I have uploaded the awstats for Host-Hunters for you to see the traffic. I know awstats isn't the greatest but I thought it would help. Last edited by Host-Hunters : 12-28-2013 at 04:32 PM. If you want to start learning about VPS and everything there is about it I can recommend starting with a Lowendspirit VPS. for €3 / year you get either 64 or 128 mb RAM with 15 GB disk. it offers ipv4 over NAT and 5 ipv6 and there is a pretty active community around the lowendspirit vps project. Thank you for the suggestion, I was looking for something US based and more ram. Since it's going on an active site. not sure about hosting providers that will provide you one for that "amount" in ads. What I will say is that you should probably start with a smaller VPS (memory wise) and try to optimize what you re running. If you still want to test the grounds, perhaps a 512 mb / 50 GB / 2 ipv4 Openvz in Jacksonville, Florida @15$/year. Something thing to think about, thank you again. Are you looking for KVM or OpenVZ - do you have a location preference in the US? EDIT: Also, are you looking for a cPanel install as well or just the VPS? Just openVZ at right now and no cpanel. I want to learn the VPS without the ease of cpanel. Doesn't matter where in the US. I've taken a look and I think the main problem you're going to run into is the content/threads & posts, or lack of. I'd recommend building the forum up a bit first, then looking to a sponsor that could sponsor you a VPS. Thank you for your input. I'm working on getting the forum more active, I know once I get more providers that will pick up. All the recommendations are great, everyone, but let's keep this thread limited to its subject: a user looking for a sponsor with those specific terms. Let's stick to partnership-related discussion only. Can you give any more details on how you plan to grow the forum? I'm a potential sponsor, and the things I've listed are concerns of mine. Not trying to derail the thread. Plans are to make sure the forum stays active, and inactive forum is the worst thing you can be. I promote the site every other day on about 8 promotion forums. I have it in my signature on all forums I post on. Which include SMF support, Xenforo support and many other. Also going to add some staff members to help with the forum activity. Building a forum takes a lot of time and work that I have been doing. I also post on blogs for link backs and starting to build a twitter base as well. Just sent you an email to discuss this further. I've gotten & replied to your emails however, not sure if you've received my replies. Can you confirm? Perhaps spam/junk folder?